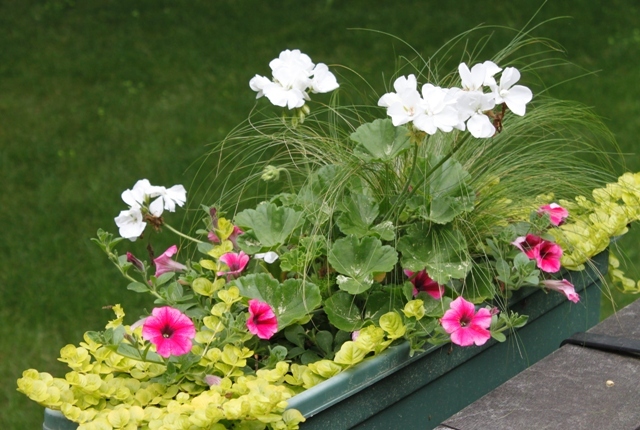 Instead of plain old petunias this year add color and texture to pop your window boxes and containers. In this planting I mixed an annual grass- Pony Tails Mexican Feather Grass, which has a beautiful, soft, arching habit with Patriot White Zonal Geranium, a Proven Winners Supertina Mini Strawberry Pink Veined Petunia and a perennial – ‘Goldilocks’ Creeping Jenny- Lysimachia nummularia to drape over the edge and give a pop of golden color. In the fall I will plant the perennial into the garden- it is beautiful draping over the edge of walls.